We’re all sash window specialists at Top Notch, and we’re a friendly, professional bunch. We turn up when we say we will, we work around your schedule, and we clean up after ourselves. Our experienced surveyor and craftsmen are true experts in their field, and hold great relationships with other local suppliers, architects and designers – meaning we can happily support you with any additional services you may require. Having your windows or doors restored or replaced might seem a little daunting, and we recognise that the quality of the installation process is just as important as the quality of the doors and windows we make. With this in mind, we always work with maximum consideration for and minimum disruption to your home, and take a truly flexible approach, adapting to your needs and requirements at all times. Jon began his career in the early 90s, working with his Father for the first Ventrolla franchise, before moving to London to set up Top Notch and direct his skills and passion into his own business. 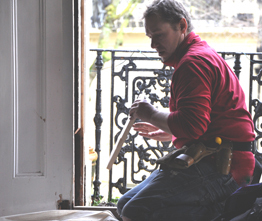 Now based in Brighton, and servicing all of London and the South East, Jon uses his 15 years’ experience to make sure each of our clients receives the very best service in sash window, door and shutter renovation or replacement. And he does so with a dedication, energy and enthusiasm that’s often lacking in the industry – meaning our clients want to use (and recommend) our services again and again. Give Jon a ring on 07787 518 229 – he’ll be happy to chat through any questions or queries you may have.